Picture crystal blue waters, perfect sandy private beaches, water creatures you’ve never seen before, small town, welcoming feel, with beauty, delicious food, and heavenly wine everywhere you turn. That’s what Kefalonia was for me. We started our morning with breakfast atOskar’s restaurant and it was the best breakfast we had since Tyssedal. Even ifyou choose to stay at a hotel other than Oskar’s (which you shouldn’t! ), make sure to at least make a point to have a meal in their restaurant. You won’t be disappointed. 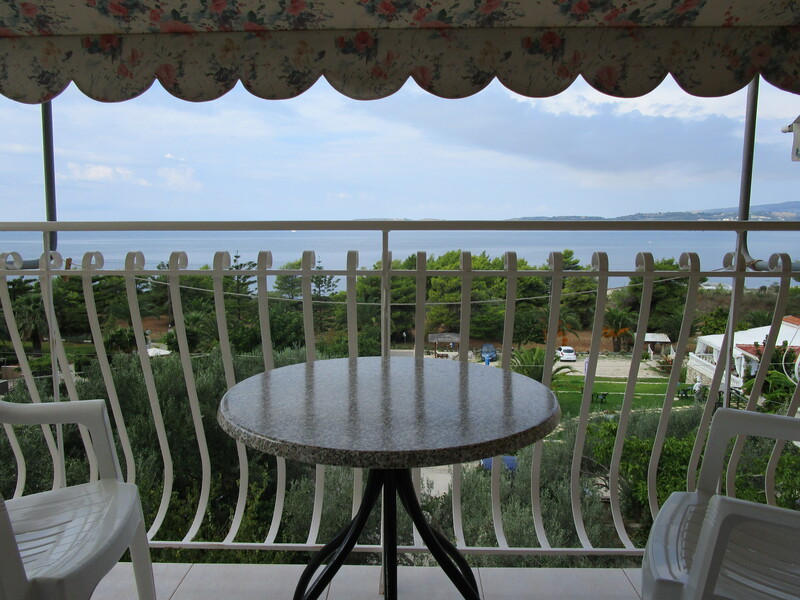 We had heard bad things about the reliability of public transportation in Kefalonia so we figured we would go rent a car to be able to get around quickly and on our own time. Little did we know, this feat was not nearly as easy as it was in Norway. We walked to town and stopped at every car place on the strip. They either were out of cars, didn’t rent for only one day, or needed an international driver’s license in order to rent. We were about to give up when we decided to try a bike place. The good news is that we were able to rent a form of transportation to get ourselves around the island….The bad news is that we had to pay a hefty 50 euro (which is 3 days worth of rental, the minimum they offered) for a few hours of use and going uphill we were lucky if we hit 40 mph. I have never felt more European than when I was cruising around the streets of a Greek island on the back of a moped. We stopped back at the hotel and grabbed a bag with our cameras, etc, checked out of the hotel room (thankfully they were kind enough to let us leave our bags again–seriously guys Oskar’s is the best! ), and set off to find the town of Sami. Of course we got completely lost and had to stop to ask for directions multiple times, but once we found the signs pointing the way it was smooth sailing. We thoroughly enjoyed cruising around on the moped…except while going uphill…which unfortunately on the way to Sami was about 80% of the trip. 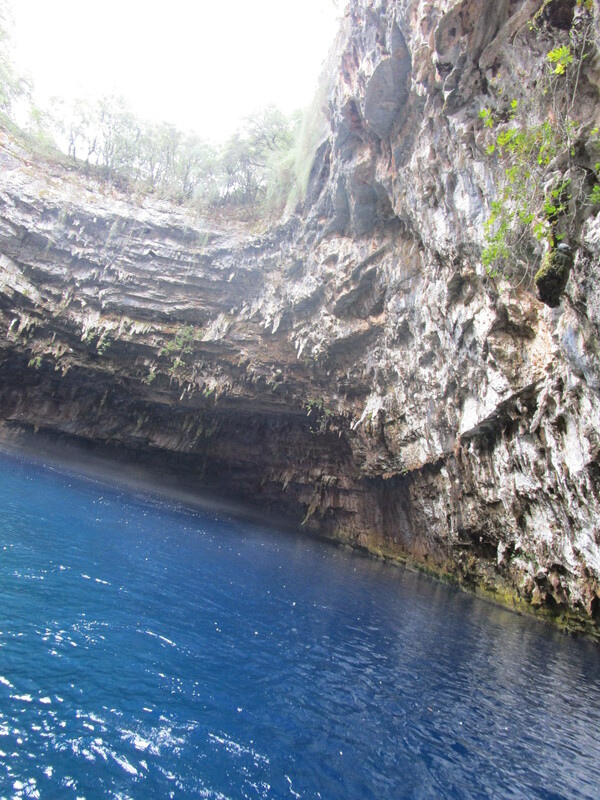 When we finally got to Sami it was easy to find Melissani Cave, which is an awesome looking cave with super blue water and a hole at the top. Apparently it is also a HUGE tourist attraction. I’m sure if I had done some research on the place I would have been more aware of this. However, I simply had seen a picture of it, thought it looked amazing and added it to our itinerary. As if any popular tourist attraction isn’t bad enough to go to, it is even worse when you arrive at the exact same time as an extremely large group of tourists filling multiple tour buses. Needless to say, the experience wasn’t nearly as magical as I was hoping. We were shuffled along with the large group of people, in through the ticket booth, down a ramp into the cave, and onto a boat with about 10-12 other people. 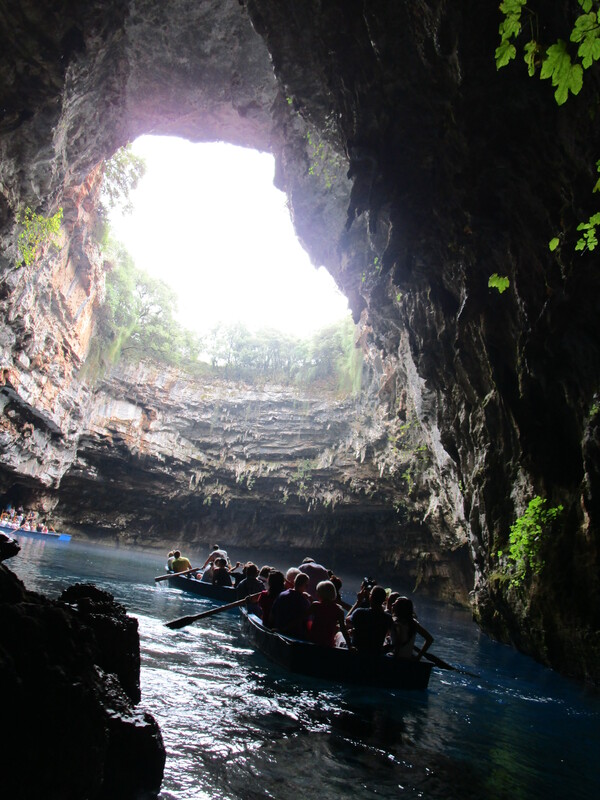 A man paddled us around the small cave, dodging the 6 or 7 other boats in the tiny cave. The entire experience lasted about 5 minutes. Then we were back at the ‘dock’ being shuffled back up the ramp so the next group of people can go. 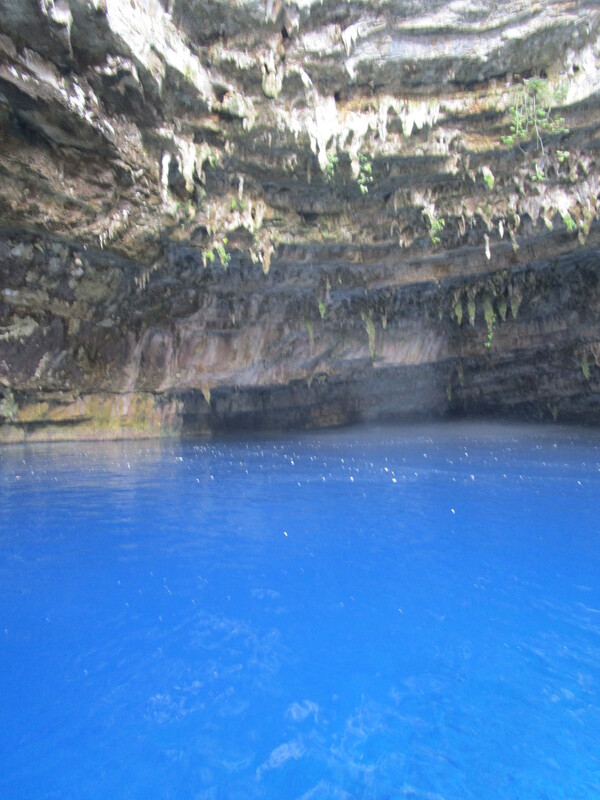 Don’t get me wrong, the cave was really awesome and the water was the purest blue I’ve ever seen. The hole at the top makes it really unique and I bet if the sun was out, the effect would have been even better. 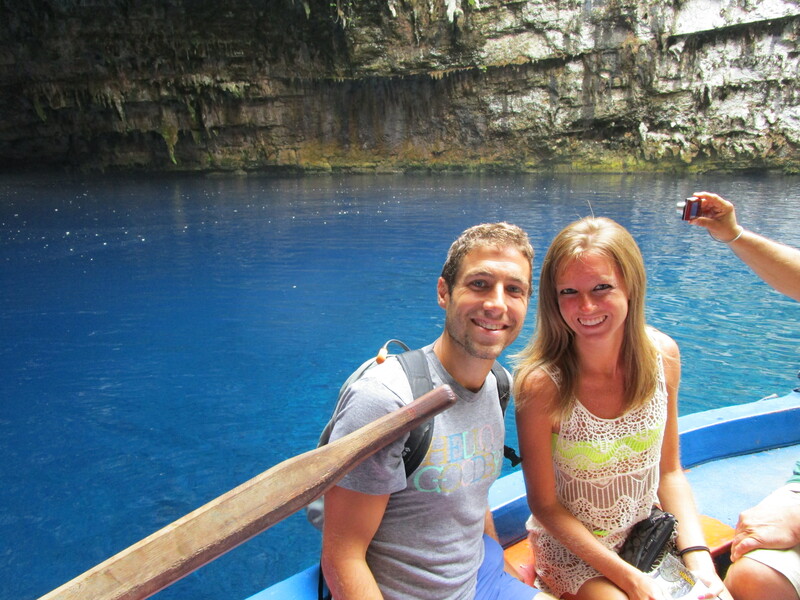 However, the experience at the cave was very rushed and just felt like your typical tourist trap. There wasn’t even a place from above the cave where you could take a picture looking down into the cave which was also disappointing. We highly considered climbing the fence around it, but didn’t want to risk whatever the punishment was for doing something like that so we didn’t. 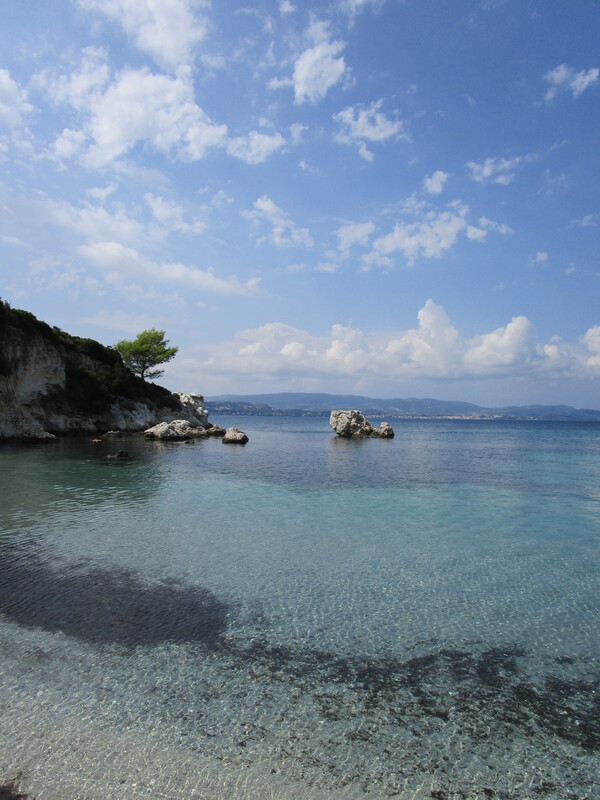 We headed back to Argostoli (going downhill instead of uphill made the trip go much quicker) and found a nice little beach down the road from Oskar’s. It had cool rock arches and clear aqua water. We saw sea urchins and starfish and those weird fish who swim sideways on the ocean floor and blend in with the sand. It was a lovely place to spend our last few hours on Kefalonia and honestly it was my favorite beach of all the beaches we went to in Greece. It was secluded and beautiful. If I lived there I would spend so much time relaxing there! If I could do the trip over, I would have spent more time on Kefalonia, but unfortunately we had to drop off the moped, grab a taxi, and catch a flight to Athens then fly to Crete. Stay longer than one day! Eat or stay (or both) at Oskar’s.